Egyptian coup: Does it mean the U.S. can't keep giving the country aid? Does the Egypt Coup Mean the U.S. Can’t Keep Giving the Country Foreign Aid? 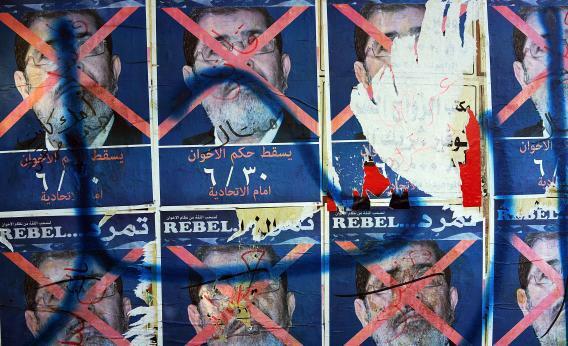 Mohamed Morsi, like Hosni Mubarak before him, isn’t the victim of a coup. He’s just, ahem, resigning. None of the funds appropriated or otherwise made available pursuant to this Act shall be obligated or expended to finance directly any assistance to the government of any country whose duly elected head of government is deposed by military coup or decree. Sounds like Egypt, where the military gave Mohamed Morsi a deadline to resign, and then informed everyone that he was out, despite his loud disagreement. In order for our government to deny that this was a coup, we need to … just sort of ignore that it was a coup. That’s what we did in Haiti in 2004, that’s what we did in Honduras in 2009, that’s kind of what we did in 2011 when the military kindly accepted Hosni Mubarak’s resignation. Mubarak was an autocrat, yes, but for three decades he ran in (un-loseable) elections against limited opposition, winning his final term in 2005. Nothing’s stopping Congress from insisting that the coup cancels aid to Egypt. But nothing’s starting them, either. In the last six months, conservatives were actively talking about cutting aid to the Muslim Brotherhood-dominated government as it kept fulminating about backing out of the Camp David Accords. (Governments do things like that to make people ignore the collapsing economy.) There’s rather less worry about the military government. UPDATE: Pat Leahy, chairman of the Senate Judiciary Committee, insists that “U.S. aid is cut off when a democratically elected government is deposed by military coup or decree.” That’s what the law says, certainly, but you know laws—they’re such vibrant, living documents! UPDATE II: And here’s the president. Review, not cancel. No mention of the C-word.